Bladder cancer is one of the top 5 most common cancers in men. There are at least 5 types of bladder cancers: urothelial carcinoma, squamous cell carcinoma, adenocarcinoma, small cell carcinoma, and sarcoma. Of the 5, urothelial carcinoma is the most common cancer type of the bladder and urinary tract. The majority of urothelial cancer cases are located in the bladder, with 5-10% formed in the upper urinary tract. Carcinomas are classified into three categories: non-invasive cancers (~70%), muscle-invasive cancers (~30%) and metastases-forming tumors (rare). A cancer is deemed non-invasive when the cancer mass is confined to the inner wall (consisting of mucosa, urothel and lamina propria) and does not reach into the underlying muscle layers. Fortunately, this tumor form has the best prognosis and treatment options. Muscle-invasive cancers that protrude into the detrusor muscle located below the urothel and lamina propria require complicated surgical removal and often have a poor prognosis. Metastases-forming tumors that have spread to lymph nodes in the vicinity or even other parts of the body represent end-stage cancer. Standard therapy for urothelial cancer consists of surgical removal of the tumor mass followed by tumor-unspecific chemotherapy. Unfortunately, the recurrence rate of non-invasive tumors is 50-70% leading to a 10-year survival rate of only ~50% and the life-long need for monitoring tumor recurrence and continued health care expense. Invasive carcinomas require much more aggressive treatments and have far worse prognosis than early stage tumors. This highlights the need for early detection and readily-available, easy-to-use and cost-efficient tools to detect and fight bladder cancer. The current detection gold standard is a visual scanning of the bladder and ureter wall for in-situ cysts by endoscopy, termed cystoscopy, upon appearance of indicative symptoms, e.g. hematuria (blood in the urine), pain when urinating etc. Tumor classification and prognosis are based on subsequent histopathology of biopsies of the detected cysts. Although quite specific, cystoscopy has a number of caveats: it is expensive, time-consuming and relies heavily on the experience of the operator. Ureteral and renal cysts are often overlooked and the detection of early-stage, small cyst cancers is difficult. Additionally, whilst being minimally invasive, it often has very discomforting side-effects, such as subsequent hematuria, pain and dysuria. Non-invasive methods analyzing blood- or urine-borne factors are thus highly desirable. Figure 1: Overview of the standard diagnosis for bladder cancer. Voided urine cytology, the microscopic analysis of cells from urine samples that were shed from the tumor mass, is a commonly used detection method. While being highly specific, it is impaired by low sensitivity, especially towards small or early stage tumors. Hematuria, often a symptom accompanying larger cysts, can hamper cytological analysis severely. Specificity of cytology, especially towards smaller tumors, can be improved by immunohistochemistry (IHC)-based detection of carcinoembryonic antigen (CEA or CD66e) and two types of mucins on exfoliated urothelial carcinoma cells. Another method to improve cytology is fluorescent in-situ hybridization (FISH) of the DNA of cells extracted from urine to detect excess (aneuploidy) of chromosomes 3, 7, and 9, and loss of the 9p21 locus, which is typical of urothelial carcinoma cells. Other methods use sandwich ELISAs or colorimetric immunoassays to detect Bladder-Tumor-Antigen (BTA) – otherwise known as Human Complement Factor H-related protein or Nuclear Matrix Protein 22 (NMP22) – contained in the urine, either as free proteins or within exfoliated cells that are being lysed prior to analysis. Figure 2: Specificity testing of CD66e mAb (ALX-805-077). 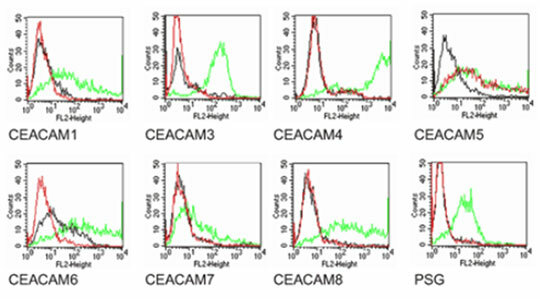 Members of the CEA family were expressed on BOSC cells after transient transfection with expression vectors containing either the cDNA of CEACAM1, 5, 6, 7 or 8. Recognition of CEACAM3, 4 and of a recombinant transmembrane-anchored PSG1 fusion protein was tested on stably transfected HeLa (CEACAM3, PSG) and CHO cells (CEACAM4), respectively. Expression of the constructs was confirmed with monoclonal antibodies known to recognize the corresponding proteins (CEACAM1, 3, 4, 5 and 6: D14HD11 (Prod. No. ALX-805-080); CEACAM7: CAC2; CEACAM8: TET2; PSG: BAP1; green curves). An irrelevant monoclonal antibody served as a negative control (black curves). For specificity testing, protein G purified 26/3/13 was tested on all CEACAM transfectants. A positive signal was only obtained with CEACAM5 expressing cells (red curves). Unfortunately, none of those detection methods offer the combined sensitivity and specificity to be sufficient as a stand-alone test for bladder cancer, especially in regards to small or early stage tumors. Therefore, a broad variety of experimental urine-borne biomarkers is being investigated and occasionally used for detection purposes. Urine protein biomarkers, such as Bladder Carcinoma proteins (BLCA) 1 and 4 and several cytokeratins are promising detection targets. Furthermore, a variety of genetic markers present in urine, such as gene mutations (FGFR3, p53), methylation of specific genes, certain mRNAs (CDK1, HOXA13, MDK, IGFBP5, PON2), and microRNAs show great potential. Additionally, metabolites in urine such as lactate, phosphocholine, adenosine or succinate are being investigated as potential biomarkers for bladder cancer. One very promising source of detection target material and an exciting development in biomarker research for urothelial cancer are extracellular vesicles. These membrane-enclosed vesicles are released by a broad variety of cell types into the surrounding extracellular environment and are normally of exosomal origin, meaning they are formed by the endosome compartment of the cell and afterwards secreted. Extracellular vesicles serve in cell-to-cell communication locally within the tissue as well as in long-distance communication by transporting proteins, lipids, and nucleic acids, and transferring them to recipient cells, influencing their activity and function. Tumor cells often show high levels of extracellular vesicle excretion and utilize this to suppress anti-tumor immune responses, trigger angiogenesis and promote tumor growth. This makes extracellular vesicles an excellent source of cancer-specific biomaterials. One highly interesting detection read-out is the overall content of extracellular vesicles within urine samples. CD63, a membrane antigen prominently present on multi-vesicular bodies and thus extracellular vesicles originating from these cell structures, has shown to be a reliable marker for the detection and quantification of extracellular vesicles in urine samples. Furthermore, a broad variety of vesicular cargo transported by extracellular vesicles from urothelial carcinoma cells is currently being investigated.. 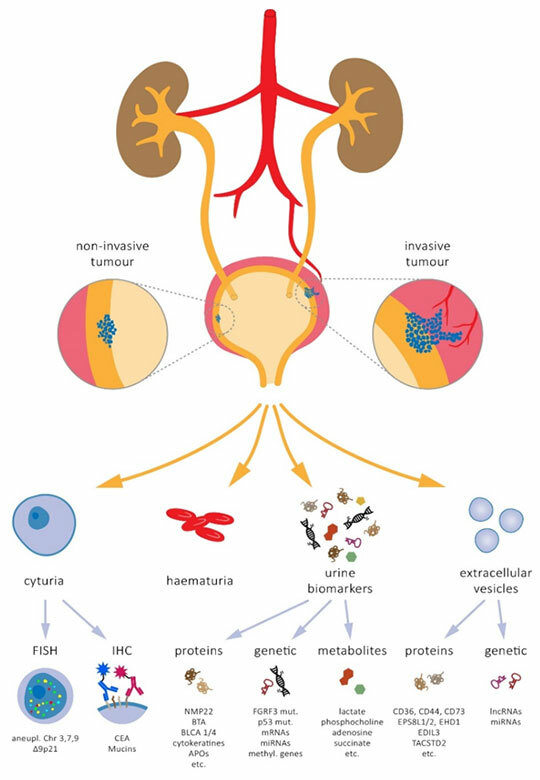 While proteins contained in urinary extracellular vesicles are naturally a research focus in the pursuit of new detection tools for bladder cancer, a particularly interesting vesicle cargo is of genetic origin. Mainly micro-RNAs and long non-coding RNAs are in the spotlight, especially because nucleic acids allow for testing of a wide variety of targets simultaneously, with high specificity and in high-throughput fashion – and all that at comparatively low costs. Enzo Life Sciences is a global leader in Immunodetection, Genomics and Cytogenetics Analysis. We offer a range of products for your Cancer research needs. Not sure whether to use IHC or ISH, or both in your cancer research? Our guide will help you figure it out. Or check out our tips for successful IHC. For a simple and efficient method for generating labeled DNA for FISH, please check out our Nick translation DNA labeling kit as well as a list of our SEEBRIGHT® fluorescent dUTPs. Unsure whether to use biotin or digoxigenin for ISH probe labelling? We can help you there! While you are at it, please check out our TechNote on the pros and cons of FISH, aCGH, and NGS. For all questions and concerns regarding any of our products, our Technical Support Team is here to assist!